Hello and welcome to the 122nd installment of the SWD. Syrian Democratic Forces are still clashing with Islamic State in Al-Sinaa district of Raqqa, the former is close to having full control over the district. SDF also entered Al-Bareed district. Foreign Islamic State’s commander and head of the Immigration and Foreign Recruitment Agencies, Abu Abdullah al-Kosovi, was killed on the 8th of June in northern Syria, possibly in Raqqa. Syrian Arab Army captured Thawrah Oil Fields, southwest of Tabqa. SDF didn’t stand still as SAA advanced, SDF captured Al-Ajrawi, Jubb al-Ghulah and Jubb al-Jahlan, from Islamic State, also southwest of Tabqa. Amaq Agency reported death of six SDF‘s fighters and destruction of a truck and a bulldozer, due to an attack by Islamic State on Abu Khashab village, southwest of Al-Shaddadi. Syrian Arab Red Crescent mediated a deal between Syrian government and rebels, regarding the evacuation of an individual, accompanied by two people, from Fuah and Kafraya pocket towards Damascus. In return, the same number of people will be evacuated from rebel-held part of Yarmouk camp towards Idlib. Hayat Tahrir al-Sham started a large arrestment campaign against rival rebel groups across the Idlib governorate. The main and usual targets of this campaign are participants in Turkey-led Euphrates Shield Operation and members of the groups refusing to align with Hayat Tahrir al-Sham. Former commander of the Free Syrian Army’s 21st Combined Force (101st Infantry Division), Ahmad Mousa, was kidnapped by HTS. Similarly, Jaysh al-Islam’s commander, Fahd al-Aboud, was also kidnapped and his car confiscated by HTS in Al-Bara. In Kafr Nabl, HTS raided homes of Mohammed Nizar al-Bayoush and Hamoudi al-Yusuf al-Jaar, fighters belonging to Jaysh Idlib al-Hurr (Free Idlib Army), they were arrested for unknown reasons. VBIED exploded in the western part of the city of Idlib, near Al-Kastana roundabout, seriously injuring the driver. Unknown gunmen tried to assassinate Major Farah Melhem Abdullah (Abu Adnan), commander of the 3rd Free Idlib Army’s brigade. Assassination attempt occurred at the outskirts of Kansafra as the Major was in his car. Turkish Gendarmerie killed seven civilians as they tried to illegally enter Turkey through the smuggling routes, western Idlib. Hayat Tahrir al-Sham’s head of the “Department of Political Affairs”, known as Zaid al-Attar, resigned from his position. Al-Attar was previously known as Abu Aisha during the Jabhat al-Nusra’s lifetime, then as Hossam al-Shafei, spokesman for Jabhat Fatah al-Sham. Al-Shafei changed his nom de guerre to Zaid al-Attar after being criticized and linked to Jabhat Fatah al-Sham during the Qatari-backed talks about Fuah-Kafraya-Zabadani-Madaya deal, he signed the agreement as Zaid al-Attar. Info transmitted by Enab Baladi. Syrian Ministry of Defense confirmed SAA‘s gains around Arak. 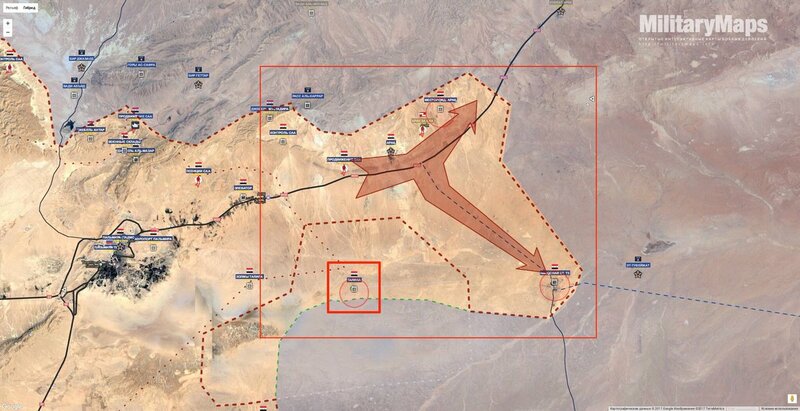 Building on yesterday’s advances, SAA captured T3 Airport, T3 pumping station, and Bayt al-Juhayshal. East of Palmyra, Amaq claimed destruction of SAA‘s tank with an anti-tank guided missile. Unconfirmed reports suggest that Syrian government’s National Reconciliation Committee met with local “leaders” of rebel-held Douma and Harasta, in East Ghouta. Two parties discussed possibility of a reconciliation and negotiated the prisoner exchange deals. This info should be taken with a grain of salt, since SAA heavily shelled outskirts of Harasta today. Rebels reported destruction of SAA‘s tank in Industrial area/zone, Daraa city. Islamic State’s improvised explosive device left behind in Al-Sahl vilalge, Al-Lajat area, injured one civilian. Rebel “Daraa Martyrs Documentation Office” reported death of five Free Syrian Army’s fighters due to airstrikes and clashes with SAA in Palestinian camp, confirmed rebel death toll since the 3rd of June is at least 30 fighters. Islamic State’s fighters in Old Mosul district launched a sizeable attack against Iraqi Federal Police’s positions south of Old Mosul. At least 50 IS’ fighters infiltrated Al-Dandan and Al-Dawasah districts, resulting in clashes with Iraqi forces and large, alleged casualty numbers. 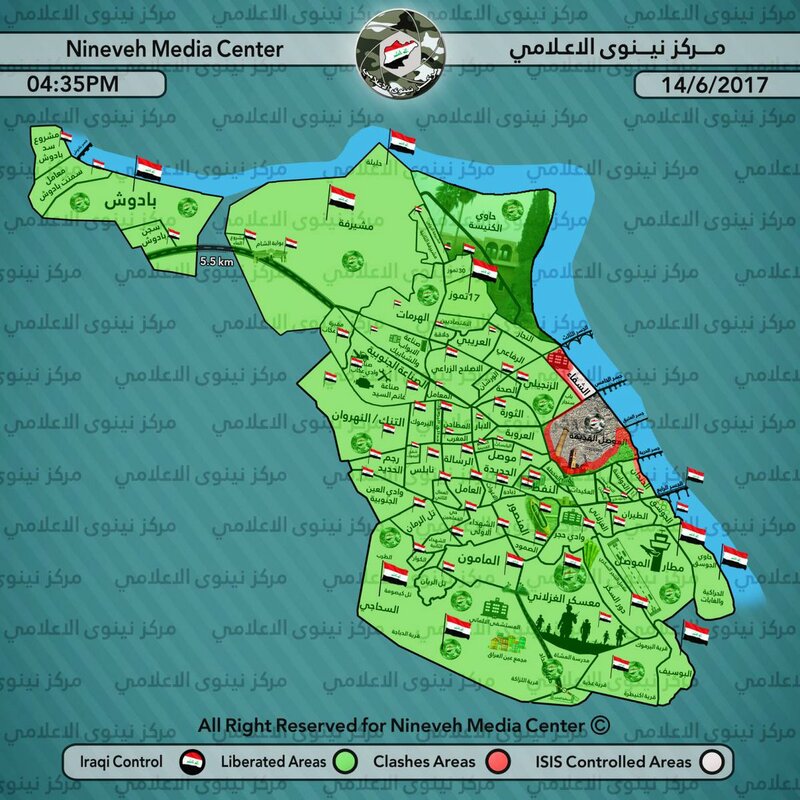 Iraqi sources described the IS’ infiltration and attack as a “tactical operation” aimed at luring IS out of Old Mosul towards other districts, in order to minimize the civilians casualties and make it so that IS’ fighters can’t use civilians as human shields. IS’ fighters that infiltrated districts south of Old Mosul were surrounded and then reportedly killed by Federal Police. However, Amaq Agency released a number of statements regarding the events in west Mosul showcasing a “successful” day for Islamic State. Besides clashes in Al-Dandan and Al-Dawash, Amaq reported clashes in Al-Shafaa district, Bab al-Toub and Ras al-Jaddad neighborhoods, and Al-Nabi Shayat and Halab streets. In the IS’ attacks on Al-Dawasah, Al-Nabi Shayat, and Halab, around 40 Iraqi troops were allegedly killed and six vehicles destroyed. In Al-Dandan, 12 more vehicles of Iraqi Army were destroyed. Islamic State’s VBIED at the outskirts of Bab al-Toub neighborhood reportedly killed 14 Iraqi soldiers. IS’ snipers killed four Iraqi soldiers in Ras al-Jaddah, according to Amaq. Clashes in Al-Shafaa reportedly resulted in death of three Iraqi soldiers, including an officer. Islamic State launched another attack on Al-Mawali village, east of Tal Afar, today’s attack allegedly resulted in death of eight Iraqi soldiers and destruction of mine-resistant ambush protected Cougar vehicle. Islamic State launched an attack against Peshmerga on the road between Tikrit and Tuz Khurmatu, the latter reportedly lost five soldiers and three vehicles in the attack. Islamic State’s improvised explosive device destroyed Iraqi Army’s Humvee in Rabia area, Al-Sadiyah. Yesterday, Islamic State’s snipers reportedly killed two Iraqi soldiers in Al-Tabi and Al-Sheikh Hamad areas, north of Baghdad. On the 13th of June 2017 CJTF-OIR has conducted 28 strikes in Syria. CJTF-OIR‘s main focus in Syria at the moment is Tabqa-Raqqa-Deir al-Zour region where they did 25 strikes supporting SDF‘s operations against IS destroying nine IS oil storage tanks, two IS well heads, 12 fighting positions, six vehicles, five ISIS boats, two VBIEDs, a recoilless rifle, a command and control node, and a tunnel; and suppressing an IS tactical unit. Other area where three airstrikes occurred is Abu Kamal (Al-Bukamal) destroying three IS well heads, three IS oil storage tanks and an IS oil separation tank. Full report on CJTF-OIR strikes conducted in both Syria & Iraq can be found here. Islamic State clashed with Taliban southwest of Jalalabad, at the outskirts of Jabrhar area, the latter reportedly lost nine fighters. Amaq Agency reported death of Five Filipino soldiers in Mabandi district and additional three in Maradou district, Marawi, due to clashes with Islamic State’s groups. Great report. I like the detailed content and rich information aided with maps and statements.